In the last few months, Magic: the Gathering card prices, especially for anything seeing play in Modern, have gone up and up and up. These have not been steady increases over time, these have been spikes over the course of a few days. The examples are many and varied. Zendikar Fetchlands are now worth more than most of their color counterpart original dual lands! I’m giving serious thought to this being a bubble of unsustainable growth. Wizards of the Coast, in its shareholder meetings, has referred to Magic’s growth at between 20% and 25% yearly for the past four years. Each of the big fall sets has broken sales records, and while we don’t get specific numbers of packs/boxes sold, we can look at tournament attendance and see how many more people are participating than ever. Can this go on? There are individuals who make a living buying and selling Magic cards. These aren’t even commodities of value, these are collectibles that are used in a game. Counterfeiting hasn’t precisely caught up but it’s a real threat. I’m worried that even without this game becoming a public fad, there’s a real chance that we’re reaching saturation. We have attempts at market manipulation. The subreddit for mtgfinance is cracking down on such behavior. TCGPlayer has long been influenced by a ‘race to the bottom’ price philosophy. In the current state of things, one site moving their price means that lots of others jump in as imitations. You may not agree with Starcity’s prices, but when they increase their sale price, others have followed suit before long. We have more places to play and more formats to play. We have amazing choices for customizing our accessories and languages to play in. I don’t think that it’s all going to come crashing down, but I’m concerned enough that I feel it’s time to sell some stock. I’m cashing out some of my EDH decks, because some of the cards have gone high enough that I’d rather have the cash, instead of a deck I only play once every few months. The casual formats have seen increases in value, but it’s Modern that has me most worried. 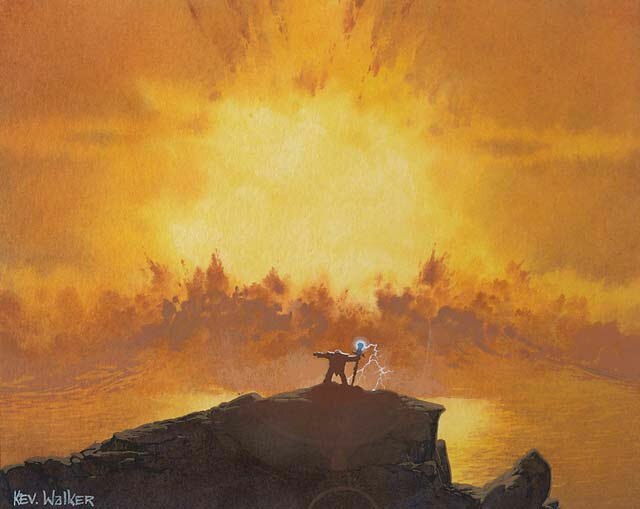 Wizards has more of an interest in keeping Modern healthy than it does Legacy or Vintage. Modern is a format that will not supplant Standard, but instead, they will work together. When your sweet cards are no longer Standard-legal, you’ll try to make them work in Modern. Wizards has put a lot of effort into this format, making it accessible to a range of strategies, and they use the banlist with an eye towards the health of the format. What is not healthy for the format is the cost, and that cost has gone up much higher, much faster than I believe they anticipated. I’ve talked about reprints before, and with the recent price explosions, Wizards has to be thinking about reprinting lots of things. Chronicles was too much; Modern Masters was not enough. It’s anyone’s guess how long it will take to get these reprints on the market, but there is a consensus of thought that it will happen eventually. So I’m selling some of my cards. I am cashing in on some enormous percentages. I have a Gaea’s Cradle that I got in 2011 for $60 in trade. I have a Bitterblossom left over that I got for $20. I have a lot of $10-$20 cards that I got for significantly less, and I’m moving out of them. I’m not trying to cause a panic. I’m stating my opinion that casual players aren’t going to be able to hang with these decidedly not-casual prices. Just in the past couple of years, the cost associated with building a high-level Cube or foiling out a deck has gone up tremendously as more people chase that same goal. I’m advocating that if you have put a lot of money (or at least, a lot of energy that has become monetary value) into a set of cards, you should think about how much you could get for it. How often do you play with your all-foil Cube? Would you rather have a new (used) car? Would you prefer to use that money as the security deposit and first month’s rent on a new place to live? Perhaps it’s enough to pay the down payment on a mortgage. We want you to maximize the return you get on playing Magic. We want you to gain the most value possible. It’s time to think about what that value can get you. i’m selling extra fetchs and some modern cards at GPmontreal (this weekend). MTGfinance is crazy so i will sell some before the bubble burst, or before WOTC annonces Chronicle 2.0. this just cant continue that way. anyone that knows finance (real finance) know that this market is not healty right now, something will happen! so i think i will keep just a modern deck or 2, a couple of EDH and continue to play limited! i might regret it in 10 years just like people that sold P9 15-20 years ago for less than 1000$… but i think i prefer more money in my pocket right now. As a player recently returned after a long hiatus, I agree, the prices are crazy right now. I don’t know that I see any complete crash (as some compare this to the housing market several years ago), as people are (hopefully) not taking out huge loans to pay for these cards. Rather, I see at the minimum a peak level at which prices will not be sustainable beyond, followed by a normalization and mild-moderate decline in prices. While I will try to acquire cards I want, to use, I would hesitate to invest too heavily in cards that have jumped to very high levels at this time. As you stated, now seems a time to either sell or to hold what you have, but investing in very pricy modern cards seems risky at this time. Definitely looks like now is the time to sell for Lorwyn through Eldrazi. Just sold two Bitterblossoms + a Vendilion Clique for $150. Couldn’t turn that down. 1) Prices are spiking. In some instances this amay be appropriate, as it could be a reaction to a market condition (for example, unbannings or new cards being released), but for the most part the spikes we’re seeing recently are not in line with basic market fundamentals. In this market, basic market fundamentals would center around print run (which you can infer a number of ways) and playability. With fringe playability, is Bitterblossom a $60 card? Are fetches, a rare in a post 2008 set, and the first set of a block, really worth $100? Snapcaster at $40? 3) “It can only go up”. This is a statement that I’ve heard over and over and over again. I heard this in the 1990s regarding the stock market and dot-coms (does anyone remember DOW 36,000? ), and again in the mid 2000s with the housng market. I understand these are different markets, but when people start to believe that the sky is the limit then there’s bound to be a crash. My advice, sell what you’re not playing with, or trade it for stuff you need and get the premium you want. Keep in mind that any reprints we see (outside of special set runs) will have the crap printed out of them. Guaranteed, if it’s a rare getting reprinted (like Fetches), you’ll see well over 1,000,000 of them printed. For sets prior to Return to Ravnica, that would be more than double their previous print runs.